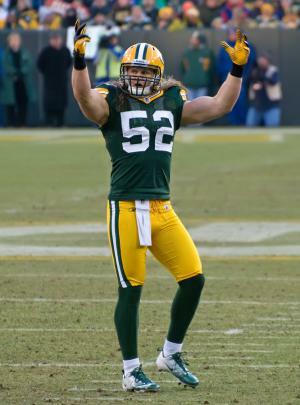 William Clay Matthews III was born on the 14th May 1986, in Los Angeles, California USA, and is a professional American Football player who, under the nickname “The Clay Maker”, is widely known as a linebacker for the Green Bay Packers in the National Football League(NFL). Have you ever wondered how much wealth this talented sportsman has accumulated so far? How rich Clay Matthews III is? According to sources, it is estimated that the total size of Clay Matthews’ net worth, as of early 2017, is $40 million which has been acquired through his NFL career that has been active since 2009. Clay Matthews III was predestined to become a successful American Football player – his grandfather Clay Matthews Sr. was an offensive tackle for the San Francisco 49ers, his father Clay Matthews Jr. was a linebacker for the Cleveland Browns and later the Atlanta Falcons, his uncle Bruce Matthews was an offensive tackle for the Tennessee Titans and finally, his brother Casey Matthews is a linebacker for the Minnesota Vikings. Clay Matthews III made his first steps towards American Football during his time at Agoura High School in Agoura Hills in California, where he played for the Agoura Chargers. Subsequently, he continued his education at the University of Southern California where he joined the Trojans football team as a walk on student athlete. Hard work and dedication brought Clay his first rewards – USC’s Co-Special Teams Player in 2006, 2007 and 2008, which made him the first player in the history of USC who won that title three years in a row. The real breakthrough in Clay’s career came when, as one of the top prospects, he was selected #26 by the Green Bay Packers in the 2009 NFL Draft. He had a successful career start – in his rookie season, Clay Matthews III played in all 16 games and managed to score 51 tackles; he was also named NFC Defensive Rookie of the Year. These accomplishments provided the basis for the overall net worth of Clay Matthews III. In his career so far, Clay Matthews III has been selected for the Pro Bowl four times consecutively, from 2009 to 2012 as well as named a first team All-Pro in 2010 and a second team All Pro in 2012. Clay Matthews III has won a Super Bowl Championship with the Green Bay Packers in 2011. Apart from those already mentioned, he was also listed in the Top 100 Players in the NFL from 2011 to 2015. Clay Matthews III also holds the record for being the highest paid linebacker in the history of the NFL with a five year contract worth $66 million, so his net worth is certain to rise. It is doubtless that all these accomplishments, besides raising the popularity of Clay Matthews III, have also made a positive impact on the total size of his wealth to date. Apart from his professional American Football career, Clay Matthews III has also made some efforts towards acting – he has had cameo appearances in “Pitch Perfect 2” (2015) and “Entourage” (2015). Clay’s TV performances includes also 2011 WWE Smackdown, MMAthletics, The Biggest Loser and Mike & Mike TV series. When it comes to his personal life, Clay Matthews III has been married to Casey Noble since 2015 and they have one son, and they reside in Calabasas, California. Clay Matthews III is very active on Twitter, where he has almost 950,000 followers. He is also actively involved within the community, and charity causes such as St. Mark’s Lutheran School in Green Bay and Jimmy V Foundation. TV Shows "WWE Smackdown" (2011), "MMAthletics", "The Biggest Loser", "Mike & Mike"